Escape the Good Life: The World: 2005-Now: Settling down? Happy new year! Believe it or not this was my first new years day in Vancouver in 8 years. I haven't written lately mostly because I haven't gone anywhere and I'm still waiting to see what the future will bring. It's starting to look more and more like “settling down” which is an evil phrase if I've ever heard one. I've helped out with Savannah's book sales through the fall and it has done better than any of us expected, much like the trip itself. 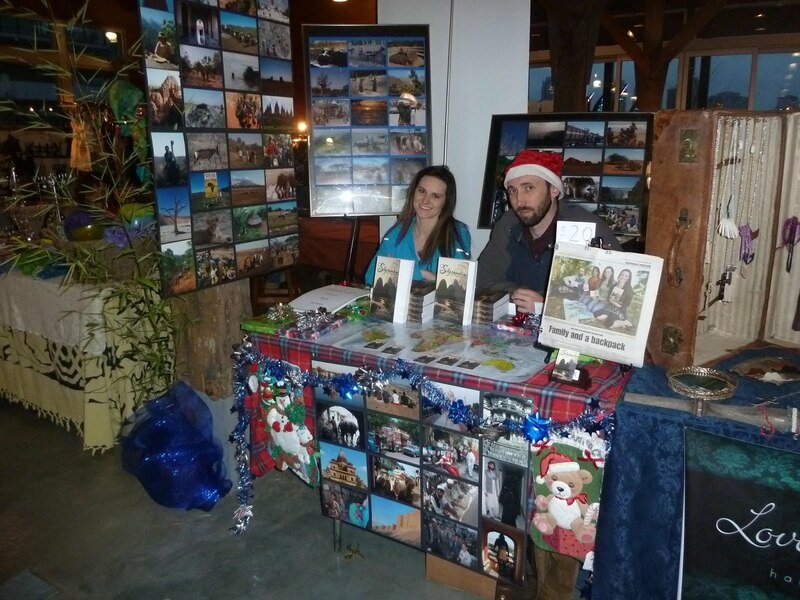 In december we did several Christmas craft fairs and managed to sell many books and do lots of promoting. But I'll leave it to Savannah to talk about all that. At one of the Christmas fairs in Vancouver. My knee slowly improves but I won't be doing any snowboarding this winter or anything else terribly strenuous either. I managed to get an MRI faster than most people and the result showed the same as what was initially suspected. PFP but no other damage. So it can be fixed but takes time and rest. It makes me a little stir crazy and having such awesome friends still abroad travelling to all sorts of exotic destinations makes me horribly jealous. The newest and most exciting thing for me is that back in August, acting on an idea I'd had kicking around in my head for a while, I applied to study air traffic control here in Canada. It's an online application initially and I finally got called in to do some aptitude testing in mid-November (which I passed) and then got through a phone interview in early December. It's an intense application process because you get hired by Nav Canada and trained so it's an all-in-one package application. Anyway, I'm currently waiting for a second, final, interview to see if I'll get put into the candidate pool and selected for any upcoming training courses. If I get in then I guess I'll be sticking around for a while and getting involved in my next major challenge. In preparation for the medical requirements (actually I failed the eye exam for a truck license after getting my air brakes qualification with mom) I've decided to do Lasik eye surgery instead of getting glasses or contacts. I have never done anything with my eyes before, so figure it's just better overall to jump straight back to good vision “naturally” than to have to deal with eye wear. My surgery date is scheduled for Jan 11th so that is freaking me out. Sky and Savannah have both done it though so that is encouraging. 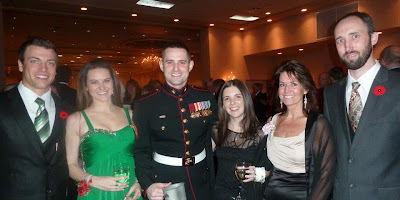 In November Sky invited the family to the Marine Corps birthday ball so we went out for a fancy dinner with him and the local marine community. They have presentations, honoured guests and fun with the whole thing though there are some very solemn, teary moments as well. At the MC birthday ball. In December Jake showed up in Vancouver. He's unofficially come to stay for a while. I hadn't seen him since our split in Singapore 3 years ago so it's great to have him around again too. This is our 4th continent hanging out together. Hopefully he'll be around for a while to ease me into the idea of being in one place longer than I still want to be. It is great to see the book doing so well for all of you. Good luck with the flight job, it is difficult to get in but I'm sure it'll be worth it if you do. Happy New Year to you and all of the Watkins family.